The impact of this one 3D game was so successful to have put some serious impact on my head at that time and I instantly found ,in my 8th standard of junior schooling, that I wanted to make games in the future as a career. I am pretty sure I wasn’t alone with such an uprising feeling of doing something which was totally fresh as a career option at that time and most of the people didn’t even know how to generalize it with a term. Some felt Nintendo was just overreaching. With the Game Boy being such a megahit many felt Nintendo did not make a real effort to create a new gaming system. 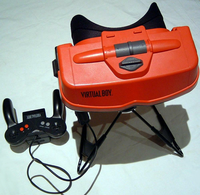 It was felt the Virtual Boy offered almost no real advantage over the Game Boy and with the GB costing almost one hundred dollars less most were not willing to shell out more cash.